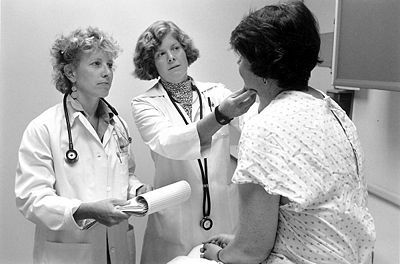 Physicians, like the ones shown here, examine patients and prescribe treatments for optimal health. Physicians are medical professionals concerned with maintaining or restoring human health through the study, diagnosis, and treatment of disease or injury. Also referred to as healers, medical practitioners, doctors of medicine, or simply doctors, physicians are among the most noble and respected of all people. Physicians possess the heavy responsibility of caring for the sick, making both medical and ethical judgments, and ultimately saving lives. Doctors are part scientists, part investigators, and part counselors. A physician must first be well-educated and must survive a grueling education and training process. He should also know what questions to ask and be able to make critical judgments. Finally, a doctor should also possess compassion accompanied by good social skills to earn the trust of their patients. Thus medicine is both a science and an art. There must be an empirical, academic approach to treating patients coupled with sympathy and the ability to understand each person's individual motivations and needs. Physicians work every day to improve the lives of others, and their work, although difficult and demanding, does not go unnoticed. The primary responsibility of the physician is to diagnose and treat patients accurately. The position is very demanding with long and irregular hours. A physician leads a medical team consisting of other doctors, nurses, and healthcare professionals to care for patients. The job of the doctor is to diagnose and treat diseases or conditions. In a typical day, a physician spends the day meeting with patients and filling out paperwork. When meeting with patients for routine examinations, the doctor will ask the patient several questions regarding their health and their medical history. Then he will address any symptoms or conditions and examine various parts of the body to check for any possible risks, including the heart, thyroid, ear, nose, and so on. The doctor's job is not only to address the concerns of the patient, but also to help prevent future complications and provide for long-term health. For instance, high blood pressure can lead to many heart problems, so physicians test for that and prescribe a plan for diet, medicine, and exercise for the patient if necessary. After meeting with patients, the doctor must fill out the patient's medical records to ensure that other health care practitioners will know how to treat the patient. If there are problems, they prescribe treatment for ailments including prescription medication, procedures, surgery, or therapy. The field of medicine offers various career options. Of the approximately 633,000 physicians and surgeons currently practicing in the United States, 95,000 are self-employed and own their own practices; owning one's own practice is one of the most demanding yet most profitable options for physicians. Approximately half of them work in offices of physicians and eighteen percent are employed by hospitals. The remaining seventeen percent are employed by the government in public colleges and universities as well as by private colleges and outpatient care centers. A growing number of physicians are joining group practices, associations of physicians that allow for more affordable medical equipment, support staff, and other business advantages. Within hospitals, physicians can also seek positions in administration, management, or leadership. The university setting offers even more options. Physicians can do medical research or even teach. Surprisingly, medical professors at universities often earn more than the university's president. Physicians with a desire to serve poorer populations with little to no compensation also have many options. They may work at free non-profit clinics that earn money mainly through grants. Doctors Without Borders is another organization that sends volunteer doctors to underprivileged countries or devastated areas to help the sick and injured. Pediatricians specialize in caring for the health of children, like this baby girl. Surgeons perform operations to correct diseases or problems such as a cleft lip deformity in this instance. General physicians are separated into two groups: physicians (M.D. 's) who offer general, ongoing preventative care (M.D. 's) and osteopathic physicians (O.D. 's), those that place specific emphasis on the manipulation of the muscular and skeletal systems. Many choose to undergo additional training and specialize in a specific field of medicine. 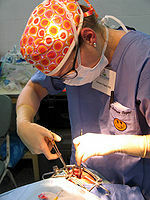 Some specialize in a particular medical field or system of the body such as the central nervous system, the heart, etc. The following table shows information about some of the top medical specialties, their popularity, and general details about the respective fields. Anesthesiology $321,686 5.5 Focus on the care of surgical patients and pain relief. General Surgery $282,504 5.0 Treat injuries, diseases, and deformities through operations. OB/GYN $247,348 5.6 Focus on the health of women, including pregnancy care. Psychiatry $180,000 5.2 Mental health care. Internal Medicine $166,420 20.1 Diagnose and offer non-surgical treatment for a wide range of ailments. Pediatrics $161,331 9.6 Care for the health of infants, children, teenagers, and young adults. Family Practice $155,010 12.4 Assess and treat a wide variety of people and conditions. 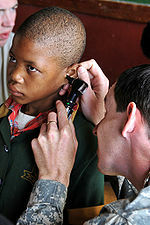 This U.S. Army physician examines a patient from the Swaziland as part of a relief effort. Physicians and surgeons can find employment virtually everywhere as the need for experts of the human body is always great. The job outlook for physicians and surgeons is favorable. The continued expansion of the health care related industries and a growing and aging population all suggest an increase in job demand. Experts predict a job growth of fourteen percent between 2006 and 2016, a rate which is faster than the average for all occupations. Because of a perceived shortage of medical practitioners in rural and low-income areas, there is also a high demand for physicians and surgeons in those areas, particularly those who are willing to practice in specialties. Though the profession is projected to grow in demand, consumer preferences, health care reimbursement policies, and new legislation could drastically alter the projections. If changes to health care increase out-of-pocket costs for consumers, the demand for physicians will decrease. New health care legislation currently being discussed will also affect the entire health care industry. If legislation approves a government-sponsored health insurance plan, many customers may quit their private insurance companies in favor of the government plan. A public plan is very likely to underpay doctors, such as in the programs Medicare and Medicaid. Additionally, new technology like electronic medical records will increase productivity and therefore may decrease job demand . Physicians and surgeons command very high salaries and are among the most well-paid of all occupations. The average starting salary for physicians is $120,000 a year. After five years, the average salary increases to $128,000 and after ten to fifteen years, the number jumps to a staggering $240,000. The next step in the process to medical certification is medical school. Contrary to popular belief, a pre-medical degree does not guarantee acceptance into medical schools. Acceptance into medical school is highly competitive. There are 146 medical schools in the U.S. and of those 126 teach allopathic medicine and award the Doctor of Medicine degree (M.D.). Schools evaluate academic prowess as well as an applicant’s character, personality, leadership skills, and extracurricular activities. Many schools also require an interview with admissions committee members. Admission into the top medical schools, such as John Hopkins University, is extraordinarily competitive. During the last year of college, students must take the MCATs, a required test for most schools. If admitted to a medical school, the student will enter a four year program that includes clinical work and book learning. Traditionally, two years are spent in the classroom with another two in the clinical setting. Classroom courses are devoted to pathology, pharmacology, neuroanatomy, biochemistry, physiology, and histology. They also learn about medical ethics, laws governing medicine, and how to take medical histories, examine patients, and diagnose illnesses. Medical students will also have to dissect cadavers (human corpses) in a gross anatomy class. The two years spent in the clinical setting take place at local hospitals or medical practices. At this point, students are expected to offer diagnoses and suggest treatments in real-life situations with the approval of a certified instructor. In this clinical training, students rotate through internal medicine, family practice, obstetrics and gynecology, pediatrics, psychiatry, and surgery. The clinical training serves to help the student identify what field of medicine they would like to pursue. In the fourth year, students apply for internships. After four years of medical school, students are required to pass the USMLE (the medical boards) to receive their medical degrees (M.D.). If they pass the test, they can apply to be licensed or registered, usually through a state agency. Because the costs of medical training are remarkably expensive, the Association of American Medical Colleges reports that more than eighty percent of medical school graduates in 2004 were in debt, one that often exceeds $100,000. 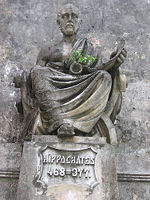 A statue of Hippocrates. Salvador, Bahia. Brazil. Once certified, a three-year internship and residency program is entered (a graduate medical education that amounts to paid on-the-job training). Interns and residents work under the supervision of other doctors in a hospital and must learn to put classroom experience into practice immediately. Residencies are notorious for requiring long hours, but reports of exhaustion forced hospitals to dramatically limit the hours a resident works. After the residency is complete, the doctor is fully certified and is ready to begin work. If they choose to pursue a specialty, such as dermatology however, more training is required. ↑ 1.0 1.1 1.2 Physician Career Profile By Andrea Santiago, About.com Guide. ↑ 2.00 2.01 2.02 2.03 2.04 2.05 2.06 2.07 2.08 2.09 2.10 2.11 Physicians and Surgeons Bureau of Labor Statistics: Occupational Outlook Handbook. ↑ 3.0 3.1 3.2 3.3 3.4 3.5 3.6 3.7 Physician The Princeton Review. ↑ Six Critical Health Care Reform Issues by Tamara Lytle. AARP Bulletin Today. ↑ 6.0 6.1 6.2 Pre-Medicine The Princeton Review. ↑ Hippocratic Oath Definition Medical Dictionary. Top 5 Reasons to Work in the Healthcare Field By Andrea Santiago, About.com Guide. This page was last modified on 25 July 2014, at 10:36.